TSAMTO, October 31. The amount of funds allocated by the Turkish government on defense, security and intelligence to grow in 2013 by 16.3% compared with 2012, reported «Jane’s Defence Weekly,» referring to the Ministry of the country money. The total budget for these items in 2013 will amount to 45.3 billion lire (25.1 billion dollars) compared with 39 billion lire in 2012. Increased funding is largely explained worsening confrontation with the PKK and the possibility of armed conflict with Syria. 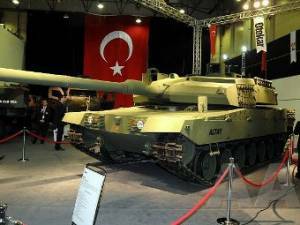 Budget of the Ministry of Defence in 2013 will increase from 18.2 to 20.3 billion liras (an increase of 11.8%). State Intelligence Organization (MIT) will receive 995.5 million pounds (750.9 million pounds in 2012) in connection with the expansion of the range of tasks assigned to it. Budgets General Directorate of Security and the Coast Guard Command also will grow to 14.7 billion pounds (12.1 billion lire in 2012) and 432 million pounds (375.9 million pounds in 2012), respectively. Budget State Security Council (MGK) will increase from 14.3 million pounds in 2012 to 19 million pounds in 2013, and the funds allocated to the Secretariat of public safety and order (KDGM) will increase to 20.2 million pounds from 19.1 million pounds in 2012. Budget of the Ministry of Internal Affairs increased to 2.8 billion pounds (2.5 billion pounds in 2012), the General Command of Gendarmerie — up to 5.8 billion pounds (4.9 billion pounds in 2012). Hosted by the Ministry of money budget must be approved by Parliament, but by the existing experience, the legislature occasionally enters the configuration document, proposed by the Ministry. It must be emphasized that defense and security are also sent to extrabudgetary funds. Sources most of them are not published. One such source is the fund for the acquisition of weapons by the Secretariat of Defense Industry (SSM). Lack of parliamentary oversight over spending on defense and security does not allow professionals to reliably identify the costs of Turkey for this purpose. Yet, of course, that they are superior to the number posted by the Ministry of money.